The What: IHSE launched the Draco OPS+ KVM extender, a new 4K DisplayPort KVM module designed for larger ultra-high-definition displays that incorporate Intel's open pluggable specification (OPS+). The What Else: Based on IHSE's Draco Ultra DisplayPort CON extender, the Draco OPS+ extender features video and USB-HID display components for KVM. This extender can transmit video signals up to 4K/60Hz at 30-bit, 4:4:4 resolution for distances of up to 5 kilometers via single-mode fiber with no latency. It uses Fraunhofer IIS lightweight image coding (Lici) technology, which yields higher color accuracy and improved image quality to overcome the limitations of traditional video compression techniques. The result is full, instant interactivity with artifact-free images and no delay in signal transmission. With the addition of a KVM matrix switch, users can control networks of screens and deliver content to appropriate displays as and when required by simply switching sources. The matrix switch can support USB data, allowing users to add a local keyboard and mouse when the monitor is appropriately equipped. Built-in control methods allow permission-only access to touchscreen displays, podium presentation equipment, or an operator's workstation before granting access to the CPU. IHSE created the Draco OPS+ KVM unit to support the growing number of digital-signage installers implementing OPS+-based solutions. The extender benefits users in environments such as training rooms, boardrooms, command-and-control centers, museums, mobile production trucks, kiosks, and video wall venues. Users in these environments now have a more cost-effective way to share common computer and server access without the need to install an additional extender box at the screen location. In areas with limited space and power outlets, the OPS+ KVM provides a cleaner cabling setup with transmission connections directly to the display. "As large video walls become more centralized to business operations, we're prioritizing what works best for the end users," said Dan Holland, marketing manager for IHSE USA. "By repackaging the Draco ultra console extender to fit the OPS+ slot, we have effectively lowered the deployment and field maintenance costs associated with connecting workstations or digital signage over long distances." The Bottom Line: The Draco OPS+ extender is designed to simplify the installation, operation, and management of remote displays, providing single-wire connection from remote media players and source devices to screens wherever they are located. 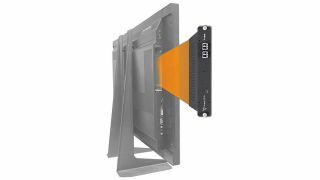 The unit is intended for system installers and users of large video walls looking for an affordable and reliable extender to support 4K video and KVM/touch-screen interfaces.